Narrative: At 6:21 p.m. firefighters responded to a reported fire in a commercial occupancy. 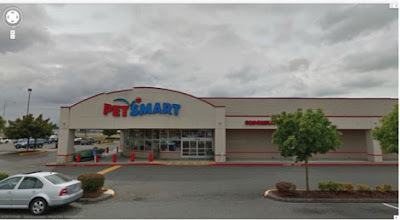 First arriving companies found heavy smoke showing from inside the PetSmart business, and upon further investigation located a fire that had started in some pet supplies kept in the retail area of the store. The buildings fire sprinkler system activated and knocked the fire down, and firefighters extinguished the remaining hot spots. In a well-coordinated effort, evacuation of the staff, patrons and various four-legged, reptile and avian occupants took center stage. Crews worked quickly to move as many animals as possible to a clean air environment and used high powered fans to ventilate the smoke from the building. None of the animals appeared to have sustained injuries in the incident. The cause of the fire was determined to be suspicious and the case was referred to the Tacoma Police Department for follow-up. The fire caused an estimated $35,000 dollars damage to the building and its contents. Narrative: Firefighters responded to a reported pan on the stove fire. Assisted with smoke ventilation and no fire extension. Narrative: Firefighters responded to a reported fire in a paper manufacturing facility. Fire was extinguished by plant personnel prior to our arrival. Crews confirmed the fire was out and there was no extension. Narrative: Firefighters responded to a reported couch fire. The fire was extinguished by the occupant prior to our arrival. Crews confirmed the fire was out and there was no extension. Narrative: Combustible metal fire in a machine shop. See original post. Narrative: Prohibited burning of a couch. Narrative: Crews extinguished a wood chip fire at paper manufacturing facility. In coordination with plant personnel, heavy equipment was used to move parts of the massive pile around to allow access to the fire for and to ensure it was out. Narrative: Crews extinguished a trash can fire. Narrative: Originally dispatched as a residential house, crews arrived to find a prohibited burn of household goods outside in the yard. Narrative: Firefighters used a booster line to extinguish smoldering material in a dumpster. The accidental fire was started when a resident discarded smoldering combustibles in the dumpster assuming they were out. Narrative: At 7:15 a.m. firefighters from stations 1,2,4,8,11,12, and 17 responded to a commercial structure fire in a aerospace part manufacturing facility. The first arriving engine company found smoke showing from the eves of the 52,000 square foot machine shop building. Upon further investigation, crews found a fire had started in a large "parts" deburring machine. With the combustible metal titanium intensely burning around the machine and in its associated collection hoppers, crews initially managed interior exposures while devising an operationally strategy to attack the blaze. Since titanium is a water reactive material (putting water on the fire makes it worse), crews had to carefully work their way around the machine and fight the fire by using numerous dry chemical and CO2 extinguishers. Once out, crews turned their attention to ventilating the heavy layer of smoke that had built up inside the structure during the extended extinguishment of the fire. All of the facilities employees were able to escape without harm, with one person being evaluated by paramedics and released at the scene. The cause of the fire was the ignition of titanium metal shavings, resulting in an estimated $55,000 damage to the building and machinery.